Korean 101 / Most favourite Korean products / review / Reviews / Skincare routine / Why I ❤ it! It doesn’t matter what season we’re in, because my skin is always so, so, so dry and flakey. A few months ago I decided to give this Korean Cult favourite a try on my pretty sensitive skin and oh boy, I cannot live without this sleeping pack anymore! Get your bank cards ready, because you’re going to want to get your hands on this dream in a tube! I can’t say it enough, but my skin has cleared so much since I started using Korean skincare products. No matter the price or how high end it is, Western skincare products just don’t do ‘it’ for me. They sting, itch and make my skin even more irritated than it already is. The doctor says I don’t have Rosacea, because I don’t have any visible (and/or red) veins on the areas that flare up and it doesn’t seem to be a fungus either. I do have a lot of redness and small veins on the sides of my nose and on my jawline that never seems to disappear, but no one knows what it is (I haven’t been to a dermatologist yet because my doctor thinks it’s unnecessary). People always seem to be thinking I’ve been working out when I’m wearing no foundation that day, even the slightest touch makes my cheek area flare up. Bluntly said; I’m just a fresh British/Dutch gal with rosy cheeks what I personally really dislike. Anyway, getting back to my holy grail of the moment, a few months ago I kept seeing this sleeping pack everywhere on the internet and in every Korean webshop. Everyone seemed to love it to bits and sleeping packs/masks are used by nearly everyone in Korea, because you’re putting all of this good stuff on your skin and hydrating it whilst sleeping. Now who doesn’t want that?! A lot of creams and masks I have tried before were never hydrating enough for my skin. No matter how much I slapped on, my face always felt very rough and dry. It’s very hard to explain, it’s not always extremely dry (or flakey) but more rough from dryness and really bumpy too. I had loads of small bumps all over my face and I thought it was time to give this product a shot because of it’s great reviews. My goal was to get my skin look more plump and look as if I were glowing from within. Ulmus Davidiana Root Extract – The fruit or root of Ulmus davidiana and its extract has traditionally been used as anti inflammatation medicines in China and Korea. It is also highly moisturising. Bromelain – Bromelain is an enzyme found in pineapple stems, it gently exfoliates the skin by removing dead skin cells. Pumpkin extract – Similar to bromelain, the enzymes in pumpkin break down excess keratin in the skin to reveal a smooth, exfoliated surface. Glycyrrhiza Glabra (Licorice) Root Extract – An anti-inflammatory that soothes the skin and gradually acts as a skin-whitening agent. Hyaluronic Acid – It can hold up to 1,000x its weight in water! That’s why it’s great at keeping your skin moisturised. Centella Asiatica Extract – Extracted from the Centella asiatica herb, this ingredient is traditionally used to treat damaged skin, which is proven to speed the process of healing damaged skin and to fade scars. Since the herb is antibacterial and contains wound-healing properties, it is great for those who are suffering from acne and/or acne scars. Aloe Barbadensis Leaf Juice – Aloe vera is well known for soothing and repairing the skin. The Egyptians called it the ‘plant of immortality’. Aloe Vera contains over 200 biologically active, naturally occurring constituents which include polysaccharides, vitamins, enzymes, amino acids, and minerals. And that’s not even all of the good ingredients explained! When I saw the ingredients on the tube I was blown away. This had to be good! After having cleansed and toned your face, apply an appropriate amount (tapping it into your skin, don’t rub!) and go to bed. You can wash it off the next morning, but for people with really dry skin that’s not always necessary because it soaks right in and doesn’t leave a sticky residue. If you have very dry skin, apply at the last step of your skincare routine so you get maximum hydration. I take off my make-up with an oil cleanser first (it doesn’t really matter which one I use, as long as it’s an oil-based cleanser). Secondly I use my COSRX Low pH Good Morning gel cleanser which has totally changed my skincare/cleansing game. This stuff is a-ma-zing and doesn’t dry out my skin! I usually use a toner of choice, at the moment I use the Natio Rose toner. After removing the last trails of make-up that might not have been removed by cleansing with my toner, I use my COSRX Advanced Snail 96 Mucin Power Essence. I have been using this essence for about a week now, and my skin has become even more glow-y and my bumps have become less noticeable (If you’re wondering, yes, I use this as my eye cream). It hydrates my skin so much and I also use this as my primer before applying my foundation. Depending on my skin’s needs, sometimes I use my Etude House Honey Cera emulsion which I wrote a review about a while ago, you can find the article here. After all of that good stuff I finish off with my Tony Moly the black tea London cream which I absolutely fell in love with. There will be a review about this cream soon. I can already tell you that it’s the first cream ever that makes my skin feel a lot more hydrated and look/feel plump. 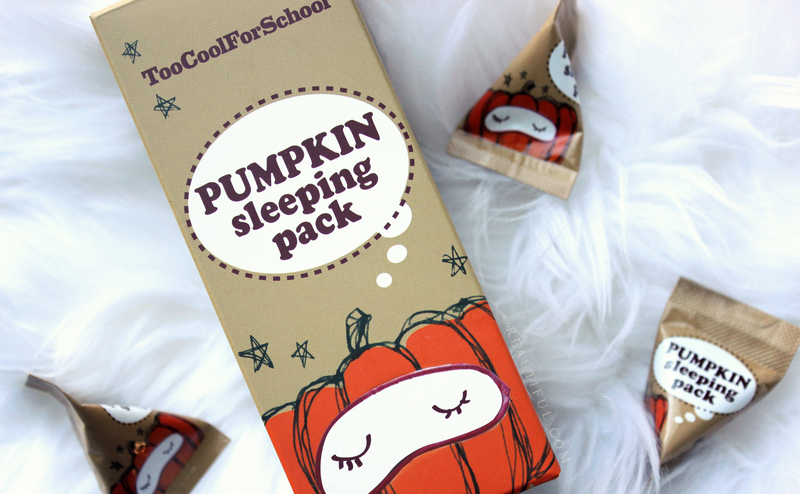 Some days I use a sheetmask or no mask at all, but most of the days I use my Pumpkin sleeping pack by Too Cool for School, because I know my skin will look amazing the next day and I can’t go wrong with it no matter which season we’re in. The product is quite thick, but sinks in really quick and doesn’t feel tacky afterwards. The little bumps on my face have disappeared after I’ve been using it every day for about a week and now I use it once, sometimes three times a week depending on how my skin feels. On the box it says use once or twice a week, but my skin LOVES this. It soaks right in and I wake up with a smooth, perfectly hydrated and plump face which hasn’t got any redness or bumps. It also makes me look like I’m glowing from within! This sleeping pack has become my holy grail product of all time and I can honestly say that I cannot live without this anymore. I’ve noticed a huge difference on the condition of my skin when I’ve started using this and it really hydrates my skin without making my T-zone extra oily. The Pumpkin sleeping pack by Too Cool for School retails for about $15 but is often available for less than that at Jolse.com (my favourite Korean webshop). I highly recommend this product to everyone looking for something more than ‘just a moisturiser or mask’, because my skin is really, really sensitive and this didn’t break me out or caused more redness at all. Usually after a mask or sleeping pack my cheeks just flare up and are hard to soothe. You can also purchase the little tester sachets which are on the pictures from eBay to see if it works wonders for your skin too. The little tester sachets cost around $5 for 10 pieces which contain a generous amount of product and they are the perfect size for taking with you if you’re travelling. ❤ The ingredient list is amazing compared to most affordable products available. ❤ It doesn’t break me out and is gentle enough for my sensitive skin. ❤ It makes me look like I’m glowing from within without having to use a primer first. ❤ It soothes my skin if it’s stressed out or if I have any breakouts. X I have no negative comments about this product at all. The only bummer is that the shipping usually takes more than two weeks in general, so if you’re running low, I’d say re-order it on time! I definitely give this product a five out of five paws! I hope this review was useful to you, but if you have any questions about this product that I haven’t answered in my post you can always ask away by commenting down below. I’d also love to hear your opinions about my blogposts, writing style or something you’d like to see (more often). A Primark musthave for this summer!